This stylish country house for 2-4 people makes a superb base for exploring Tuscany and Florence. Comfortable and well-equipped, VILLA is furnished in a contemporary style that respects its fabulous rustic setting. The house has lots of outside space for its private use : there’s a convenient deck near the kitchen for sunny breakfasts and a panoramic garden terrace for meals at sunset. You’ll find memorable countryside to explore on the doorstep. Nipozzano nearby, encapsulates the beauty and history of Tuscany. It mixes the timeless elegance of the Nipozzano Villa, (country retreat of the noble Frescobaldi family) with the rugged Castello dating back to the year 1000. Let us book you a visit to taste their award winning wines. The busy town of Pontassieve is 5 minutes by car but seems a world away. Well equipped with supermarkets, banks and restaurants, it also has a regular train service to central Florence. You can park your car free of charge in Pontassieve and catch a train to be in Florence in half an hour. It is very easy. Siena, Pisa, San Gimignano, Chianti Classico, Lucca and all of Tuscany is within reach for day trips. We live at Borgo di Sopra throughout the year. This is our home. We are always on hand to answer any questions our guests may have. The location is all. We have fabulous south-facing views across a vineyard that is cared for like a garden. The light changes constantly and at the end of the day, from the view is always gorgeous. And then there is the fact that although you feel miles from anywhere there is in fact a really efficient, busy town just 6 minutes away. Pontassieve has a great supermarket, restaurants and shops. It is not at all touristy. There is a excellent train service into central Florence too. You can even just go in for the morning and return for lunch! Gorgeous, peaceful location on prestigious Chianti Rufina wine estate. Elegantly fitted, well-equipped house. You feel a million miles from the noise and confusion of Florence, and yet it is only half an hour away. Great commuter train service from the nearby town of Pontassieve. Wine tastings at the Castello di Nipozzano within walking distance. We will send you a shopping list to complete if you would like the fridge stocked prior to your arrival. Dining table in kitchen/living room. Seating for 4 people. The owners live on site. Whilst we aim never to be intrusive, we are on hand if guests have questions or need assistance with reservations. First of all I want to give Borgia Di Sopra more than 5 stars! Jane and Gian Piero were both delightful AND extremely helpful. Not only is their property exactly as described, it is so restful and extremely clean. Everything about this place is what you would want for a Tuscan Holiday. The kitchen has all manner of dishes and tools needed if you decide to cook in. The bedrooms and the baths are also nicely done and quite spacious. Jane has also compiled a nice book of information regarding places to dine in Pontassieve and the surrounding countryside. The train station to Florence is convenient and, if needed, you can leave your car overnight. We did not find driving in Italy all that confusing (if you are familiar with round-a-bouts). Additionally the Frescobaldi vineyards surround the property and the Castello di Nipozzano is just up the hill from their property and is a nice hike. All manner of nice hiking in the area if you are so inclined. Also we were happy they have a wonderful grinning Italian greyhound mix Jasmine - It was great since we could not bring our own four legged family member on this trip. Just a side note: Jane went out of her way not once, but twice to assist us with our car. We ended up with a flat in which she assisted us by taking us to a tire repair and helped us with the Italian translation, and also provided us with a dead battery jump on the day of our departure. The location was absolutely wonderful, the house was very well equipped with everything you could need. Jane and her husband Gianpiero were very welcoming and were always willing to help with anything. The town of Pontassieve is only about a 10 minutes drive where you can find plenty of shops including an excellent co op supermarket, and also a train station with free parking, Florence is only a half hour train ride away. I would highly recommend staying in this beautiful holiday home. My wife and I have just returned from a wonderful holiday at Borgo di Sopra. 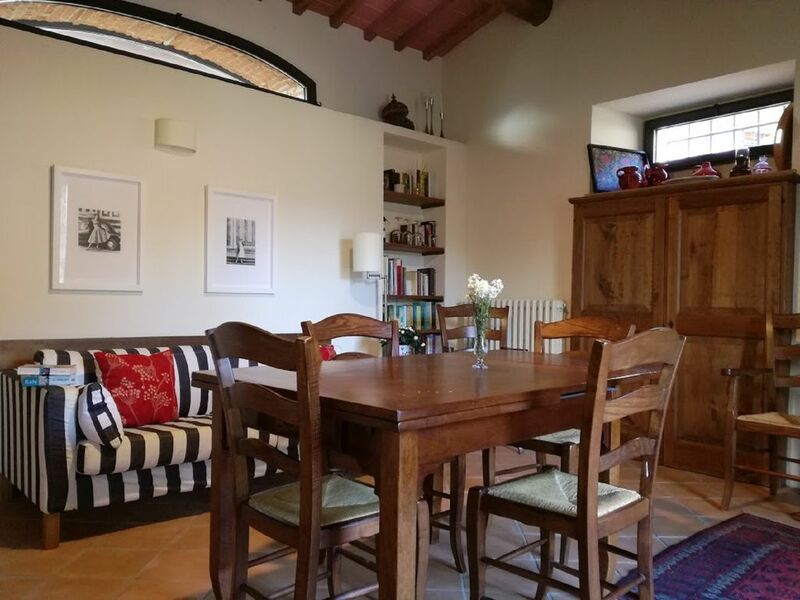 The properties are set in an idyllic location and whilst access to Florence, Siena, San Gimignano etc is relatively easy, it was lovely to return to such a beautiful, quiet area at the end of a busy day. We stayed in Villa and we were extremely impressed with the standard of our accommodation. The property was spotlessly clean and we really appreciated the care taken in choosing the furnishings and art work to create a lovely interior. The grounds were just as impressive and we enjoyed the flexibility of being able to enjoy breakfast in the sun on the upper terrace and then spend a tranquil evening on the lower garden terrace watching the sunset over the vineyards. The owners of the property Jane and Giampiero are two of the most gracious people you could wish to meet. Their friendly welcome, the advice they provided and the kindness they showed throughout our stay was greatly appreciated. We would highly recommend a stay at Borgo di Sopra and hope to return in the future. The villa was beautifully presented, comfortable and well equipped. Although very rurally located the distances to the delights of Tuscany are easily manageable for day trips. Jane and Giampierro were very welcoming, friendly and ready to help in any way they could. The top tips for restaurants wherever we planned to visit were gratefully received. would recommend this property for couples and families looking for a quiet relaxing holiday , who want to get away from it all. You will need a car when staying here, but you can easily visit Florence by train. Would return again to "recharge the batteries" in a heart beat. Absolutely perfect! Stunning views, peace and quiet. Beautiful villa. We stayed at the property Villa for 9 days. Jane had given us instructions how to find the accommodation which we did with no issues. As you approach the property you just gasp at the amazing Tuscan countryside you are driving through. The property sits on a hill, rural and with a castle sitting above it. The views are simply spectacular. We got the most friendly of welcomes when we arrived. Villa/Alba has 2 floors and very spacious. You have everything you could possibly need and the place is spotlessly clean. Aircon is provided but we never used it even though the temperature was 35 degrees everyday. Villa remained cool. Jane leaves a book of info for you regarding the house and surrounding area. I would recommend going into Florence. The train takes about 29 mins and costs little more than 3euros50!